The recent death of Leonard Nimoy, who played Mr. Spock on the original TV airing of Star Trek (and its multiple spin-offs), has caused me to revisit his appearances on a contemporary TV show, The Big Bang Theory. Well, not appearances, exactly—the actor himself never shows up. But the science guys on The Big Bang Theory all love Star Trek—references to it abound, and in several memorable sequences, the voice and presence of Spock are evoked. In the first, Spock serves as the conscience of Sheldon, the ur-nerd whose rigid beliefs and schedule are thought to be close to high-functioning autism, when Sheldon wants to substitute his roommate Leonard’s toy Star Trek transformer for his own (broken) one. Part of the fun of this is that Leonard Nimoy voices Spock just as he did in the original (see clip below). In the second, their neighbor Penny gives Sheldon a napkin Nimoy had signed. So it’s clear that Star Trek is an obvious and unmistakable presence in The Big Bang Theory. But what might not be as clear is that The Big Bang Theory owes its very structure to Star Trek. I was influenced in this perception by reading about how Pride and Prejudice has influenced many contemporary stories—the teen fave Twilight among them. The unattainable and even slightly dislikable guy who might be the one true love is common to both of them. So, let us think about how much the characters of Star Trek underlies The Big Bang Theory. First, as the clip illustrates, Sheldon kind of is Spock. He sees himself as ruled by logic; he is (due to his rigidity and a kind of a-sociability) somewhat alien—as Spock says, they are alike in being half human. Once you see Sheldon as Spock, all the other character fall into place as Star Trek types. Leonard is Captain Kirk in being the leader of the group—and more human than Leonard. Howard, seen through the prism of his early dislike of Sheldon, is Spock’s opposite, Bones McCoy, the Starship Enterprise’s doctor, whose emotional responses were the foil for Spock’s logic. (The original triumvirate represented all heart [McCoy] and all head [Spock], with Kirk combining both.) Howard’s outbursts about Sheldon’s rigid precepts and beliefs have the same “do you have ice water in your veins, man” quality that Bones’s outbursts against the half-Vulcan Spock’s commitment to logic and inability to feel human emotions have. And Raj? Well, I think Raj evokes the inclusiveness and multicultural nature of the original Star Trek. Just as Spock indicated that an alien group—the Vulcans—were appreciated and respected, the other crew members indicated that in the future, all nations and all ethnic groups were working together in a high-minded, intellectual mission. Differences were no longer an issue; they all worked together as a matter of course. 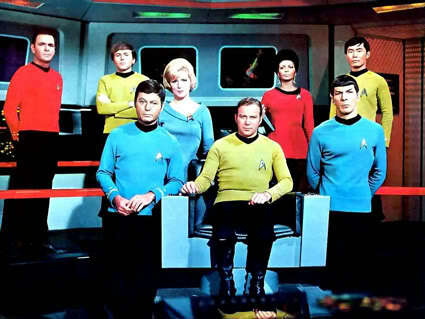 As the series went on, nearly all the crew members were multinational or multicultural—Sulu was Asian, Uhuru was African-American, Scotty was Scottish, Chekhov was Russian. Raj’s Indian-ness (and his sister in England and parents in India) is illustrative of the multinational reach of the high-minded intellectual mission of contemporary science. (And, since he is also a sci-fi geek, of the reach of that aspect of popular culture.) 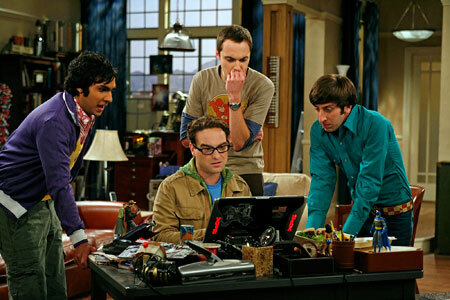 Without Raj, this is a program about 3 white guy nerds in SoCal. With Raj, they are the world. The series also has fun with mixing and matching certain qualities of the characters—often reversing them. The original Bones had a marked southern accent and a fondness for whiskey. In The Big Bang Theory, it’s Sheldon who is a Southerner, whose Texas accent comes out on occasion, and his father was an alcoholic. Although Spock is Vulcan, Leonard Nimoy was vocal about the influence of his Jewish upbringing on the character. (The “Live Long and Prosper” Vulcan salute was inspired by a similar gesture in the temple of his childhood.) In The Big Bang Theory, it is Howard who is Jewish. Coming up: the voyages of the Starship Enterprise.